It seems like throughout baseball history, each decade has had one season that stands out more than the others. Dynasties come and go, Superstars rise and fall and our country follows along as well. The 1960’s were by far one of the most turbulent times in modern American history. The world was a changing place, and baseball never one to be far behind society, was changing as well. Today’s book takes a look at one of those turbulent years in both society and baseball. 1968 has been coined as the year of the pitcher. Miniscule ERA’s and lower batting averages produced rule changes that have withstood to modern times. America was a changing place as well, so it was no surprise that the national pastime was part of the changes. What transpired in the summer of 1968 was the end of an era in baseball and ushered in changes that would help shape the future of our game. 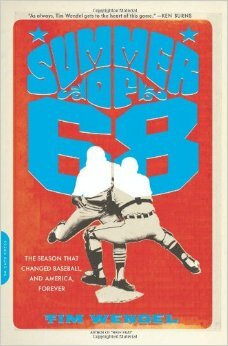 Tim Wendel has written another winner with Summer of 68. The book starts by taking an overall look at the state of baseball in 1968. Starting out in spring training you see what shape the game was in and get a good feeling of where it was heading that year. The overall main focus of the book though is the St. Louis Cardinals and Detroit Tigers. These two teams would eventually meet in the World Series that year. You get an in-depth look at both teams. Who they were, how the functioned and how the both were great successes on the field that year. Intertwined in the journey of a baseball season the author shows how the societal landscape of the United States was changing. You see how the assassinations of Robert Kennedy and Martin Luther King Jr. effected the country and both of the baseball teams as well. The reader is shown how the home cities these teams were part of, were turned into war zones. You can feel the frustration of a generation coming out in the summer of 1968. The book gives a very good look at a bygone era and what transpired in our country to change the world that we live in today. It is a nice balance between baseball and society. The book is of course heavier handed in the baseball subject, but still gives you enough of the outside world to see how it effected the players within the game. Tim Wendel did a very nice job with this book. If you were not able to witness 1968 first hand, it gives you not only a history lesson, but also a feel for what the world was like back then. You get to see the ups and downs that have shaped our world and made both our country and sport the greatest in the world. Baseball fans will enjoy this one, no matter what team you choose to root for.